My bees have been hurt very badly by wasps over the last 2 years. I lost 2 good hives last autumn and 3 this autumn despite having dozens of bottle traps around my apiaries and proactively destroying wasp nests and trapping hibernating wasp queens. This autumn I designed/invented a new type of wasp trap which has been extremely effective and I want to share it with all of you. This design is licensed under the Creative Commons Attribution Share-Alike license 4.0. You are free to redistribute, adapt or use this design for any purpose as long as you follow the terms of the license. The real innovative element in this design is that it is a device that goes between the floor of a vertical hive and the hive stand. I know of no other device that is used by beekeepers that is used in this location and I think it is a unique "outside the box" approach that happens to work very well. I am already planning to build a variation of this trap that can be used on hTBHs but I haven't had a need to protect my hTBHs from wasps yet. After I explain the working of this device it will probably seem obvious in retrospect, and I hope that my design can be adapted and improved by other beekeepers. I built this particular trap to fit under national, commercial or rose hives therefore it is 46cm square. Variations of this trap could easily be built to fit under the floors of other standard hives such as langstroth. The intended purpose of this design is to save a hive that is under severe attack by wasps. Once a hive is being attacked in this manner it is very difficult to save it using conventional tactics. Once the wasps have focused on a hive, placing bottle traps around the hive have little to no effect because the wasps already know where the honey and grubs are and they are not going to be interested in whatever concoction of sugar/beer/fruit/vinegar/catfood you have prepared for them. The more wasps that are attacking a hive, the better this trap works. There are other traps that can be used to reduce the number of wasps foraging around an apiary and this in not a direct replacement for those traps. It should be used alongside other means of pest control as part of an integrated pest management strategy. To save your hive from being wiped out you need to securely close up all the entrances as if you were going to transport the hive to a new location. After sunset is the best time to do this. The hive might be closed up for 2-4 days so you also need to consider ventilation and sustenance for your bees during this period. I strongly advise having an open mesh floor under the hive and a feeder on top of the hive. If your bees have enough honey you can just give them water in the feeder. If you have a varroa insert tray under the hive remove it so that the bees are sure to have enough ventilation. They will be unable to ventilate the hive via the entrance. Block up the slot that holds the varroa insert tray using strips of foam or duct tape or whatever works. You don't want wasps to have access to the space between the floor and the trap. The wasp trap has a solid plywood floor, 4 walls made out of 2x4 white deal with a #8 steel mesh vented area cut into each wall, and the whole thing is topped with a sheet of #8 steel mesh. In addition there are a number of tubes running from the perimeter walls of the box to somewhere close the center. I made these from 16mm steel tubing which I crimped and bent at one end and then drilled a 6mm hole near the crimp. A larger hole might be required for some species of wasps or hornets but 6mm works well for vespula vulgaris and vespula germanica. These tubes allow wasps to enter the box but it is much more difficult for them to find their way out. 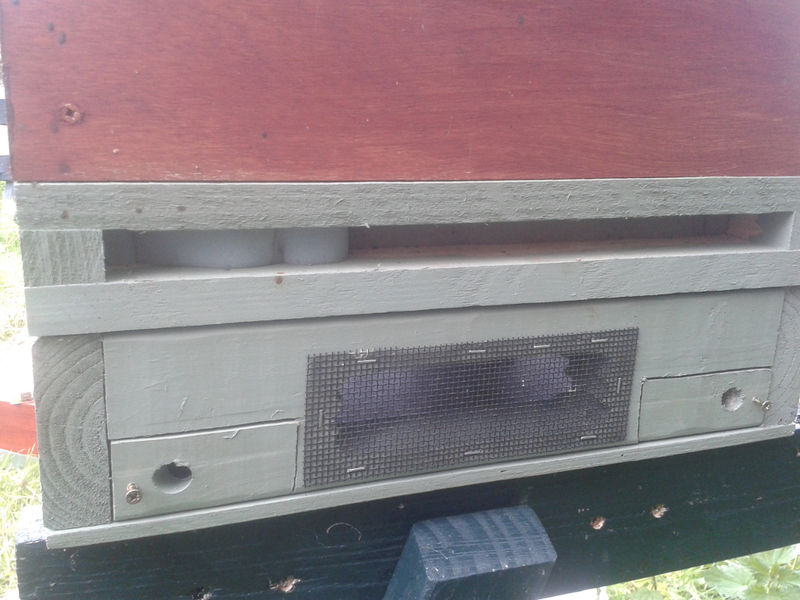 The vented panels around the outside of the box will attract the wasps when they want to leave and they won't find the tiny 6mm holes in the tubes. In the second prototype of this design I used 2 entrance tubes and installed them in 2 removable wooden blocks that facilitate cleaning dead wasps out of the trap when required. Every element of this design is important to the overall function. The sheet of mesh on top of the box allows the smell of the hive to drift through the open mesh floor and into the trap. It also allows frass such as cappings, pollen, varroa, etc to fall out of the hive and into the trap. This helps to attract the wasps into the trap. 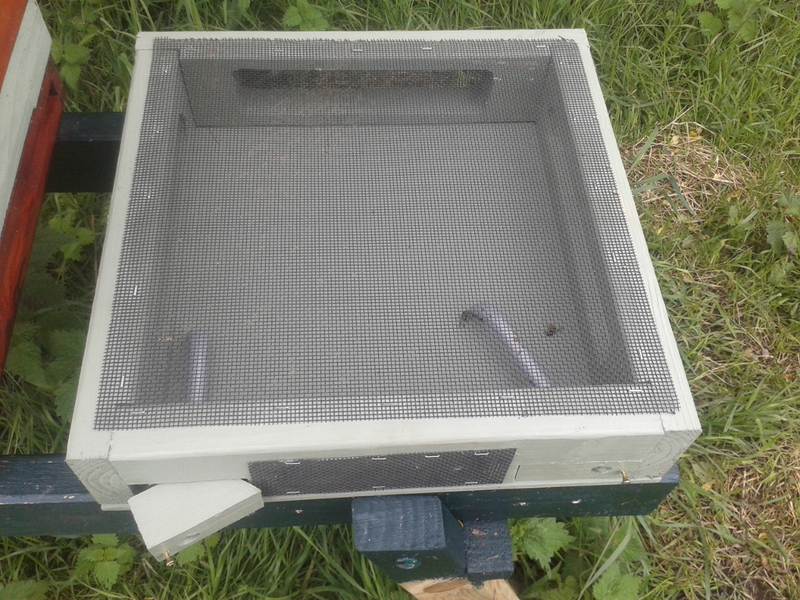 The mesh panels on the side of the trap help to disperse the smell of the hive and help the wasps to find the entrances. These pieces of mesh also facilitate ventilating the hive and letting the bees get enough oxygen to keep them alive while they are sealed in. Do not attempt to build a variation of this trap that doesn't have the mesh or you risk suffocating your hive and killing all your bees. Here you can see the floor of my hive with the entrance fully blocked with strips of upholstery foam. The entrance tubes of the trap are on the same side of the hive as the entrance so that when the wasps return they will find them easily. If there are any gaps between the trap and the hive floor they could be sealed off with a strip of duct tape or something similar. The first prototype that I built was very successful but it is very difficult to clean out without dismantling it. It quickly filled up with wasp corpses so I had to built an improved version which I am presenting here. The wasps attacking my own apiaries are now pretty much wiped out after just one week and the new improved design has been installed on a vulnerable hive at my local associations apiary. I'll post an update of that in 2 days when I go to inspect it. I think that painting the entrances yellow might help the wasps to find them more easily but I haven't tried this yet. I'm also considering using flexible plastic doors (ala porter bee escape) over the 6mm holes to make it more difficult for them to escape. I would greatly appreciate questions, comments, criticism, feedback, stories of your success or failures using this trap. I think that other beekeepers will definitely find ways to improve this concept beyond the starting point I have laid out in this post and I look forward to a season where I lose zero hives to predation from wasps. If anyone wants to purchase one of these traps from me, pm me and we can figure out the cost of shipping etc. Of course you are free to make your own if you are handy with some carpentry skills. An interesting and novel idea. Most effective anti-wasp measures are directed towards eliminating 'wasp-scouts' that approach the apiary from down-wind, so it's refreshing to see somebody 'thinking outside of the box' ! With regard to cleaning - perhaps the simplest method would be to make the trap similar to the 'Open-Backed Eke' I use underneath many of my National hives. (held in place with either wood-screws or magnets), then it would be a simple task to remove that plate in order to then pull out the debris with an 'L'-shaped scraper. I've made such a scraper from a length of steel strip with a nominal 10mm x 3mm section, around 2 feet long, with a right-angle bend around 5 or 6" from one end. Such a scraper may not remove every last item of debris, but it certainly removes most of it. Q. Do many 'robber-scout' bees end up in the trap along with the wasps ? Good luck with this, I'm looking forward to seeing how it performs next season. It's actually pretty easy to clean. 90% of the dead wasps can be shaken out in about 20 seconds. (See the youtube demo.) Live wasps tend to eat the dead wasps and hive frass when they get hungry so there's very little debris build up. In a worst case scenario, the plywood floor can be detached by loosening 8 screws. I might do that before I put it away for the winter. I've seen no bees in the trap and during the last few days I've even had it under a hive that the bees were free to forage from. It's possible that a few went in there and the wasps ate them but I check it multiple times a day and I think I would have spotted them. Even if it did catch a few scout robbers, that would probably be a positive thing for my apiary. I'm working on another model that is based on the same principle but should be more effective. I'll post an update here in about a week. I'm not in BBKA. Can you give me any further information about it that might help me to find out more about it. The name of the company or the edition/page number/author of the magazine article would be helpful. I've shown this trap to over 50 people now and nobody has seen or heard about anything like it. I've been told I should patent it but I want it to be a design that anyone can use and improve on. If someone else is trying to steal the idea and patent it that's a big problem. Nice design definitely worth a try when the need occurs. Adult wasps have a tongue (proboscis) like adult bees do and feed on sugar secretions from their grubs. In autumn when their broodnests shrink this secretion is less available and wasps get interested in our hives, beer, lemonade, ripening fruits and also flowers (ivy). This is when they become a nuiscance to us, otherwise they are very benificial to the ecosystem. Hi Adriaan. Yes, I know that insects are the main source of protein for wasp larvae. The distinction is somewhat superficial though, at least from where I'm currently looking at it. During hive inspections I've seen wasps digging bee larvae out of their cells and flying off with them. I've also seen them digging around in the brood cluster and not flying off with anything and I think they are eating either the royal jelly/bee milk or the smaller grubs. I've seen wasps leaving my hives with bee abdomens clutched in their legs. I've seen wasps cleaning out the varroa trays under my mesh floors until they are spotlessly clean. I've seen wasps cannibalising the dead wasps from nests that I've previously destroyed with soapy water. And I've seen wasps fight to the death with each other in this wasp trap and seen the live one dismembering the dead ones afterwards. I couldn't see them very clearly but I'm assuming these were different species or different colonies fighting with each other. The numbers of wasps were so high in my garden last year that every tree was covered in them. Nobody would even visit my house. Fortunately I've managed to reduce the numbers this year but I've already lost 3 hives and I'm close to losing 4. In fact, without these new traps I'm certain I would have already lost 4 or 5, maybe even 6. A beekeeper living a few miles from me lost all his hives this year to wasp predation. He has to start from scratch again next year. This is when they become a nuiscance to us, otherwise they are very benificial to the ecosystem. Yes, they are beneficial, but the numbers in my area are completely out of the normal range right now. I'm grateful for the pollination service they provide on my raspberries in the spring time. I'm grateful for the pest control service they provide in early summer. But I can't live like this dealing with a plague of wasps every August/September. If I don't take measures to control them I might as well give up beekeeping. Sorry if any of the above came across as snarky. I greatly appreciate your input but I'm having another bad wasp day today and I'm not quite ready to discuss the benefits of wasps. Since reading about this wasp trap here on Biobees, I've discovered that there is indeed a roughly similar type of commercial trap - it's called the ApiShield, and is currently being marketed principally as a Hornet trap - far more complicated than Johno's, and which retails at £50 a pop. There's a bit of a problem there though, as there are two types of hornet - one does indeed enter the hive to attack the residents. But the other - the type which is knocking at Britain's door asking for entry, does not. It predates outside of the hive, typically by hovering around the hive entrance, picking-off bees. The French have come up with a partial solution - it's in the form of a 'hive foyer', a cage made from nominal 1/2" wire mesh which provides a safe area in front of the entrance within which the bees can mingle and potter about - as they do. Apparently hornets are very leery about entering areas which present as being restrictive in any way - so don't. I have the odd wasps nests in and around my apiary but I rarely have a problem even with weak colonies. I recently relocated a wasps nest for a neighbour as it was in his greenhouse and whilst he had lived happily with it for several months, he went in one day and it had fallen and hit the ground and they were pretty upset. I made a chicken wire cage for it and put it in and hung it back up with his consent but since then they have been less friendly and respond to any vibration like the door being opened and he has started getting stung, so we agreed that I would relocate them. I actually feel quite sad for them as many people are so intolerant of them but clearly you have a major problem and I wonder what causes that. Perhaps open mesh floors are a significant facto in attracting them, allowing the scent of honey ripening to travel a long way or perhaps a bit of honey drips through it during inspections and that encourages them to try their luck. Maybe your local badger population has been wiped out and wasps are flourishing as a result..... Lots of potential reasons I suppose..... but just interesting to speculate..... I can very much understand your frustration though and think your trap is ingenious ..... kind of the opposite of a trap out for a bee colony! Thanks for that info Colin. The ApiShield does indeed have a lot in common with my trap, it's certainly based on the same principle. It seems to have been around for about 15 years and I'm wondering why it has never had any commercial success or why nobody I've spoken to (until you) has seen it. I watched a youtube video where it had been installed for a couple of days and it had caught about 20 wasps but I catch over 100/day in my one. That result is probably due to the sheer number of wasps in the vicinity though. Anyway, it's good to know that there is another similar design out there. As I mentioned in a previous comment, I've been working on another design and I'll release more details once I have a working prototype. Lots of potential reasons I suppose..... but just interesting to speculate..... I can very much understand your frustration though and think your trap is ingenious ..... kind of the opposite of a trap out for a bee colony! I've developed a lot of respect for wasps over the last few years. I've seen them farming black scale insects on my willow trees and harvesting the honeydew. I've seen them pollinating my raspberries and then coming back a few weeks later to munch on the fruit. I've taken apart several nests and seen the grubs in their cells begging for food like little birds in a nest. So I don't hate wasps, but I need to get a yield from my fruiting plants and hives, so I find myself in direct competition with them for survival. I don't know why they ones near me are so aggressive. I've IDed both vespula vulgaris and vespula germanica and there could be another (sub)species in the area too. It looks like vespula germanica but instead of having 3 black dots in the center of its face it just has one. It might just be a local phenotype of germanica, apparently the facial marking can be quite variable. These ones seem to be the most aggressive though. I'll try to take some photos and upload them. Unfortunately I don't think there are any badgers living near me. I didn't even know that badgers prey on wasps. I've seen foxes digging out bumble bee nests in the past though, but at least bumble bees have a stash of nectar that might make it worthwhile raiding them. I can understand badgers being attracted to wasp ground nests: the grubs provide a great source of fat and protein (If you can stand the horror of being stung hundreds of times). A long time ago I killed off a big paper nest about 2 meters high in a shrub in the backyard, they were too nasty and right next to the kids playground. I used a powder that needed to be applied to the entrance, the wasps would then carry the stuff into the nest as they were crawling in. it worked well: very little was needed and the nest died and that was the end of it or so I tought. The next day we went on a 3 week holiday and when we came back we were greeted by the foul smell of rotting flesh. I had thought the paper nest would just dry out but the mass of dead grubs was too great. Cutting out that thing was no pleasant job. Anyway here is a method of getting rid of wasp nests: I have never tried this myself as I never have had large wasp problems. Also it requires chemical (slow working) poison which I normally detest being an organic farmer. -first you put out dishes with strong dark beer (bees are normaly not attracted but wasps are), be sure to put in a cloth so that the wasps don't drown. -keep the dishes filled up for three days so that the wasp scouts have time to tell their nest mates about the free drinks. -then when plenty of wasps are feeding you add a liquid slow working ant poison. The wasps will carry this into their nests killing it off in the proces. -slow working poison is key as the wasps have to be able to get back to the nest before dying. - be sure no bees are feeding on the beer or this will do a lot of damage to your hives. If you do this please keep me updated.